en la VII edición del FIBA se presenta Lote 77 este viernes 9 de octubre y el viernes 16 de octubre a las 23,00 hs. en el Teatro Del Abasto. Humahuaca 3549. Bs. As. How a man constructs a male? While three men research about those tasks related to raising, selecting and sorting cattle into sale lots, they face the fragile task to recognize themselves. Lote 77, by Marcelo Mininno intends a reflection regarding the intimate male identity, getting closer to one of the primary rural activities: cattle raising and slaughter. The play walks trough the male gender construction, revisiting the historical Argentinean highlights from the last thirty years. 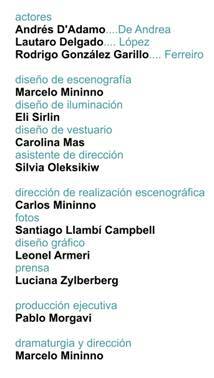 As a result of a deep process of investigation with the actors Andrés D´Adamo, Lautaro Delgado and Rodrigo Gonzáles Garillo, the director Marcelo Mininno opens his celebrated play the 8th May 2008 at the Teatro del Abasto, Buenos Aires city. 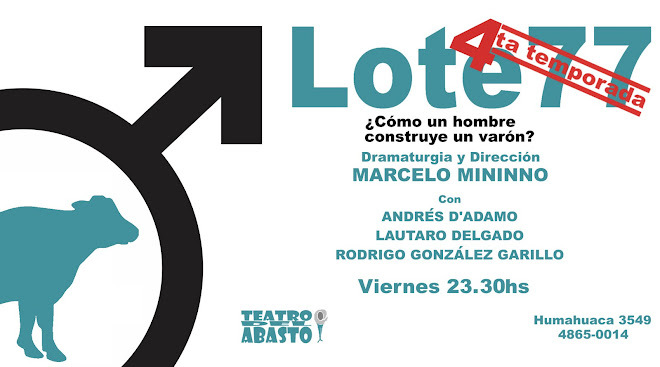 Lote 77 has been honored, in different categories, with the most prestigious argentine theatre awards (Maria Guerrero – Florencio Sánchez – Trinidad Guevara – Teatro del Mundo – Teatro XXI). Winning the Festival de Teatro de Buenos Aires (Buenos Aires Theatre Festival), the play represented the city at the Fiesta Nacional de Teatro 2009 (National Theatre Festival 2009) with highly praiseworthy critics. It participates at the VII Festival International (FIBA 09).